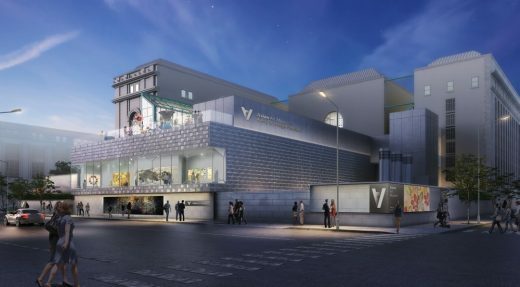 The Asian Art Museum, one of San Francisco’s foremost cultural institutions, today unveiled details of a $90 million investment in the museum’s future, one that will transform public engagement — both locally and globally — with the world-renowned collection, exhibitions and cultural programs offered by the city-owned museum. In early 2018, construction will begin on the centerpiece of this transformation: a new, 13,000square-foot exhibition Pavilion and Art Terrace added to the east, Hyde Street side of the museum’s Civic Center home (The beaux arts building was originally constructed in 1917 as the city’s main library and was repurposed as the museum by Italian architect Gae Aulenti in 2003. It is a contibutory building to the historic Civic Center Landmark District). Designed by architect Kulapat Yantrasast of wHY, the Pavilion — characterized by a rusticated gray terra-cotta tile exterior and gem-shaped bay windows — will allow the museum to increase the number of temporary exhibitions offered each year, and will be one of the nation’s premier venues dedicated to Asian art. 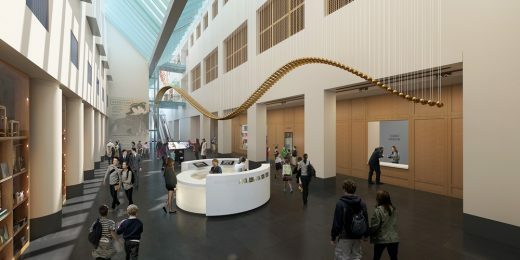 Other elements of the museum’s transformation include: dedicated spaces for contemporary art experiences; new approaches to displaying masterpieces in the museum’s collection galleries; upgrades to education classrooms and new digital technologies for enhanced interpretation. The Pavilion is scheduled to open in summer 2019. The museum will remain open during the transformation project, but collection galleries and some public spaces will close briefly on a rotating basis for reinstallation. Regular updates will be provided on the museum’s website: www.asianart.org. For All, The Campaign for the Asian Art Museum This investment in the museum’s future is supported by For All, the Campaign for the Asian Art Museum. For All is a five-year, $90 million privately funded capital campaign that underpins the transformation project. The campaign ensures the lasting success of the museum by providing financial support for stimulating programs as well as provisioning the endowment’s steady growth. 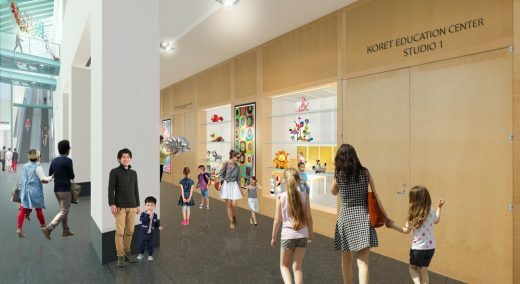 Campaign fundraising prioritizes the construction of the Pavilion and transformation of other public spaces ($38M), for exhibition and program development ($27M) and endowment ($25M). The For All campaign is chaired by Ms. Yamazaki. She and her husband, Silicon Valley entrepreneur Jerry Yang, have pledged a leadership gift of $25 million to the campaign. In recognition of their contribution — the largest financial gift in the museum’s history — the Pavilion will be officially recognized as the Akiko Yamazaki & Jerry Yang Pavilion. To date, 72 donors have contributed more than $60.5 million toward the $90 million goal. 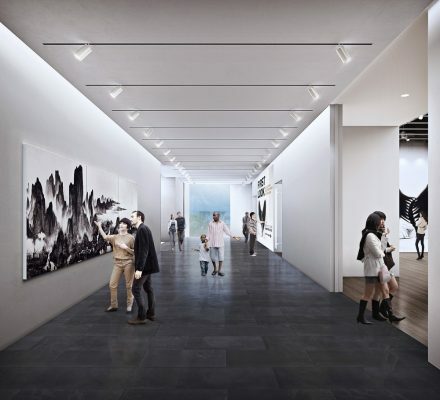 With 8,500 square feet of continuous gallery space, the Akiko Yamazaki & Jerry Yang Pavilion will give museum curators the freedom and flexibility to create exhibitions that raise the bar for interpretation, technology and design. Purpose built to industry standard specifications for large-scale contemporary artworks, the pavilion galleries will bring the museum’s historical collections into dialogue with important new work, amplifying the museum’s voice in the international contemporary art world. 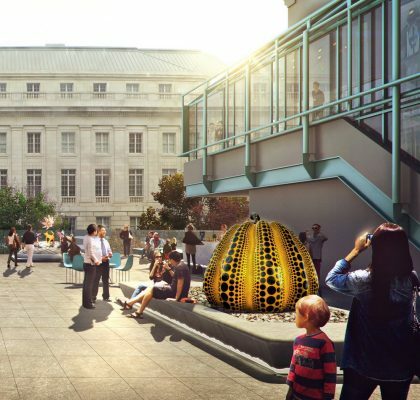 A key feature of the Pavilion is a rooftop Art Terrace, a 7,200-square-foot outdoor venue for contemporary sculpture and commissioned installations where visitors will be able to enjoy live performances and other special events. 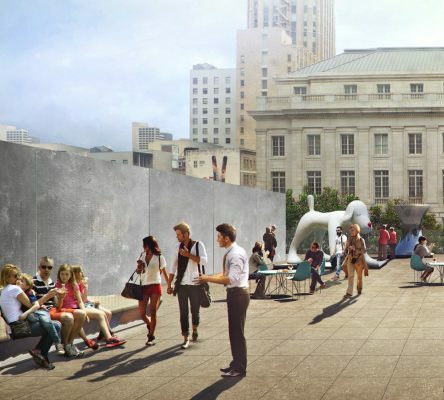 Widely supported by city leaders and neighborhood representatives, the Pavilion and Art Terrace will also be tangible contributions to an ever-changing Civic Center neighborhood, enhancing the pedestrian experience along busy Hyde Street. The new pavilion will contribute to making the area a vibrant part of San Francisco’s diverse cultural landscape. 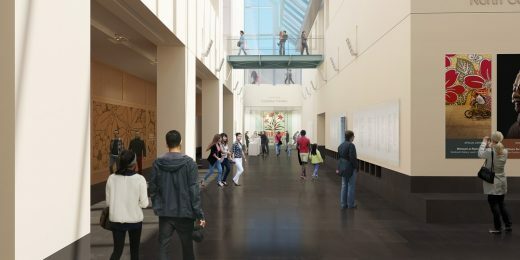 “The city of SF is looking forward to the Asian Art Museum’s building transformation, which will both enhance the experience of all who visit our magnificent museum and revitalize the Civic Center neighborhood,” says San Francisco Mayor Edwin M. Lee. 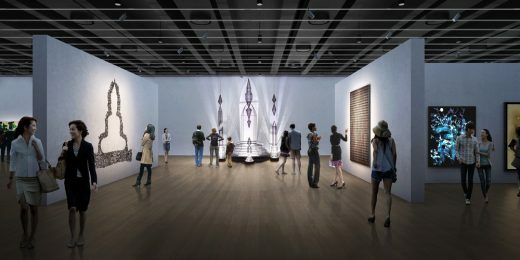 Masterpieces Center Stage: Meaningful, multilayered entry points into the collection In addition to the new Pavilion and Art Terrace, the museum will refresh its collection gallery experience through the Masterpieces project. Curators have singled out 15 works of various media representing different cultures and time periods for enhanced interpretation. Tablets, projections, photo murals and other didactic materials will enable visitors to learn more about each object and explore in real time the artworks’ interconnecting cultural, historical, and geographic contexts. This augmented approach will ensure that each visitor has a personally meaningful, multilayered opportunity to engage with some of the most significant works in the collection. ground floor, will help cultivate a new generation of Asian art enthusiasts through sophisticated and diverse art activities, eye opening storytelling and docent presentations, while longtime museum supporters will be able to enjoy hearing from distinguished speakers from across the globe in a setting equally comfortable for viewing films as for experiencing scholarly presentations. Digital Technology for a Personalized Experience Immersive digital enhancements throughout the museum will equip visitors with an array of ondemand tools to curate their own visit. Within galleries and public gathering spaces, interactive touchscreen displays and tablets will offer multilingual support and information about current exhibitions, daily programs and special events, and sophisticated digital wayfinding. Immersive interpretive content — delivered via location-aware technology — will let visitors uncover more about artworks on view, allowing them to appreciate them in a variety of contexts. This dynamic digital footprint will extend beyond the walls of the museum, engaging audiences from around the world via a mobile-friendly website, lively social media platforms and multilingual apps.